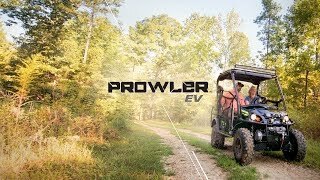 The Prowler EV features an AC electric drivetrain for noise-free performance. 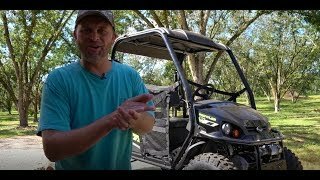 Michael Waddell shares his experience with the all-electric Prowler EV. The industry's first AC drivetrain is perfect for hunters who need to sneak up on prey, or anyone who prefers a quieter ride with no emissions. Compared to DC-powered vehicles, our electric models are 25% more efficient. Which means you'll spend less time charging and more time driving. Gas vehicles create a 30,000-sq-ft field of disturbance with noise and exhaust. A noise-free, emission-free Prowler lets you get up to 85% closer. Our 4WD never takes a day off. Always on and always ready for any challenge, so nowhere is off-limits. Upgrade to Prowler EV iS for a suspension system that effortlessly conquers the most challenging terrain.